Why Race With Us in 2016? 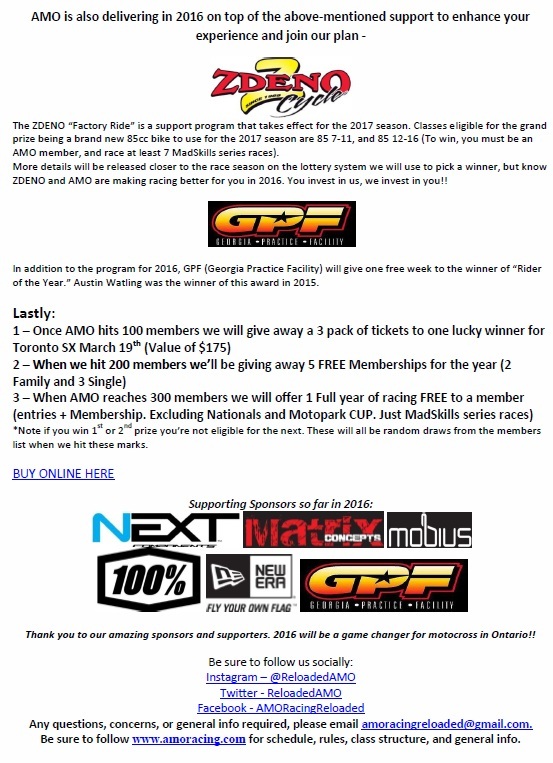 As we sit just under two weeks till the first race with AMO for 2016, we figured it would be a good time to explain why racing with us will be the best experience in Ontario you will ever have. Going motocross racing is not new, we don’t have new inventions or loads of money, but what we do have is passion and an understanding that the customer matters most. We’ll break down the reason why we feel AMO is the way to go for 2016 and beyond as we change the experience for motocross racing in Ontario. This is as basic as we can be. If this doesn’t win you over then we’re not sure what you’re looking for. – Price point membership cost $90 for single. $160 for a family. – $15 out of every single membership and $35 from all family memberships go to the year-end banquet to offset the cost for the customer. 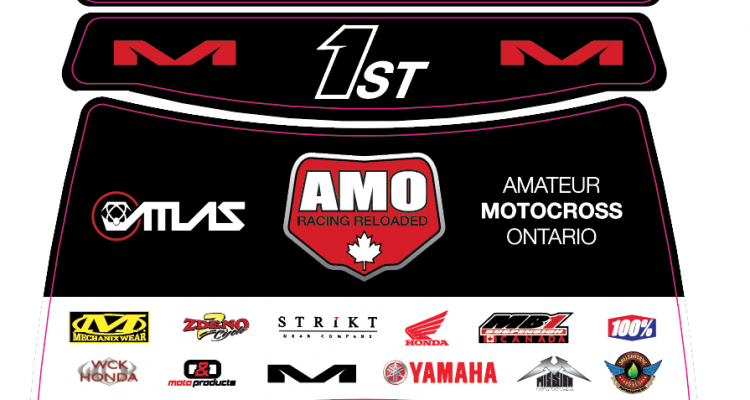 – AMO runs the ANQ (Amateur National Qualifier) races for the Parts Canada Grand National at Walton in August. – Professional staff with communication skills. * All trophy classes go back to 5th place not matter the numbers. – 50 4-6, 7-8, and GP classes have their own trophy presentation with podium and backdrop. – Aligned with MMRS for cross over events. – Allow TVR members to race with TVR membership at AMO prices. – Chance to win KTM 65 from Mission Cycle (Classes eligible that can win 50cc and 65 classes), Yamaha 85 from Zdeno Cycle (Classes eligible are 65, 85, and Supermini classes), and CR250F or 450F (Classes eligible all Beginner, Junior, and Intermediate classes have chance to win WCK award) from WCK Honda in a random draw at Atlas Brace Series ending banquet (To win bikes, you must be an AMO member, and race at least 7 MadSkills series races). – 50% payback for under 30 Int/Pro, Vet 30 A, Plus 40 A, 250 Intermediate, 450 Intermediate (Only ANQ events), and Open Intermediate. – Trophies back to 5th in every class. – Every 50 racer leaves with a trophy. – Fall pit bike series. – LIVE race results at every race. 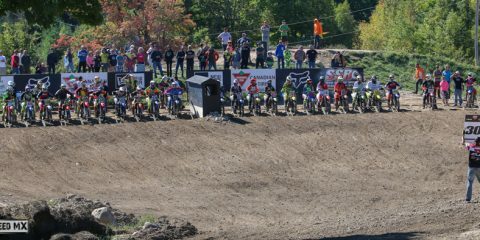 The Ontario MX scene has never seen this kind of support for racing. AMO has worked endless hours to make your racing experience for 2016 one to remember. That makes three bikes to be given away, as well, over $20,000 in event and Atlas Brace Madskills Series ending prizing. *Note if you win 1st or 2nd prize you’re not eligible for the next. These will all be random draws from the members list when we hit these marks. 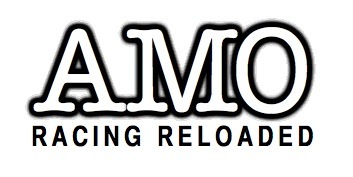 AMO Racing is extremely excited to announce a partnership with D&D Moto Products for 2016. D&D Moto Products is a new company starting from the ground up. As an added bonus, for the month of March when you purchase an AMO membership you will receive (by email) a discount code. This can be used at http://dndmoto.com/ giving 20% off your order. D&D will also be set up a certain events beside registration offering a discount on the spot when you enter an AMO event. 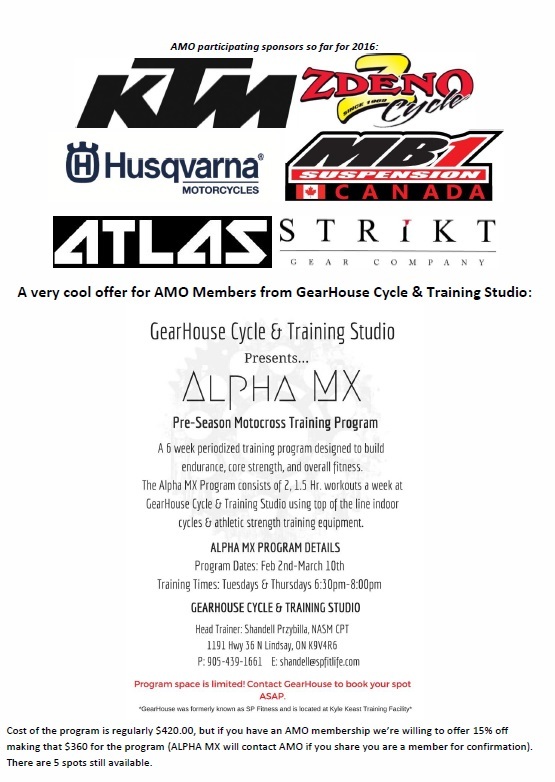 The benefits of racing with AMO are endless. As promised AMO will be giving away a 2017 KTM 65 thanks to the fine folks at Mission Cycle. 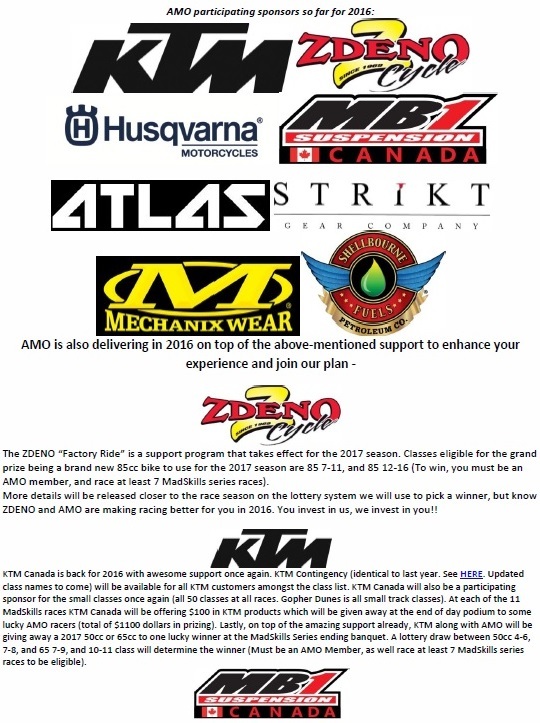 Mission Cycle with support from KTM Canada, along with AMO, will have a lottery draw between 50cc 4-6, 7-8, and 65 7-9, and 10-11 classes to determine the winner (Must be an AMO Member, as well race at least 7 MadSkills series races to be eligible). That makes two bikes to be given away, as well over $20,000 in event and series ending prizing. Thank you to our amazing sponsors and supporters. 2016 will be a game changer for motocross in Ontario!! 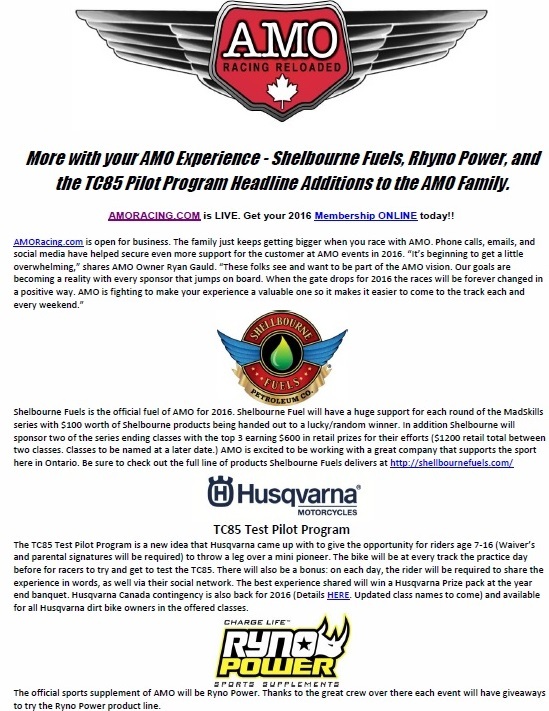 PDF – AMO Racing News Letters #3- More with your AMO Experience – Shelbourne Fuels, Ryno Power, and the TC85 Pilot Program Headline Additions to the AMO Family. More with your AMO Experience – Shelbourne Fuels, Ryno Power, and the TC85 Pilot Program Headline Additions to the AMO Family. AMORACING.COM is LIVE. Get your 2016 Membership ONLINE today!! The TC85 Test Pilot Program is a new idea that Husqvarna came up with to give the opportunity for riders age 7-16 (Waiver’s and parental signatures will be required) to throw a leg over a mini pioneer. The bike will be at every track the practice day before for racers to try and get to test the TC85. There will also be a bonus: on each day, the rider will be required to share the experience in words, as well via their social network. The best experience shared will win a Husqvarna Prize pack at the year end banquet. Husqvarna Canada contingency is also back for 2016 (Details HERE. Updated class names to come) and available for all Husqvarna dirt bike owners in the offered classes. The official sports supplement of AMO will be Ryno Power. Thanks to the great crew over there each event will have giveaways to try the Ryno Power product line. The ZDENO “Factory Ride” is a support program that takes effect for the 2017 season. Classes eligible for the grand prize being a brand new 85cc bike to use for the 2017 season are 85 7-11, and 85 12-16 (To win, you must be an AMO member, and race at least 7 MadSkills series races). More details will be released closer to the race season on the lottery system we will use to pick a winner, but know ZDENO and AMO are making racing better for you in 2016. You invest in us, we invest in you!! KTM Canada is back for 2016 with awesome support once again. KTM Contingency (identical to last year. See HERE. Updated class names to come) will be available for all KTM customers amongst the class list. KTM Canada will also be a participating sponsor for the small classes once again (all 50 classes at all races. Gopher Dunes is all small track classes). At each of the 11 MadSkills races KTM Canada will be offering $100 in KTM products which will be given away at the end of day podium to some lucky AMO racers (total of $1100 dollars in prizing). Lastly, on top of the amazing support already, KTM along with AMO will be giving away a 2017 50cc or 65cc to one lucky winner at the MadSkills Series ending banquet. 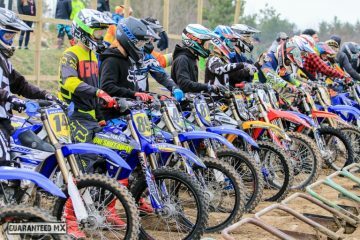 A lottery draw between 50cc 4-6, 7-8, and 65 7-9, and 10-11 class will determine the winner (Must be an AMO Member, as well race at least 7 MadSkills series races to be eligible). 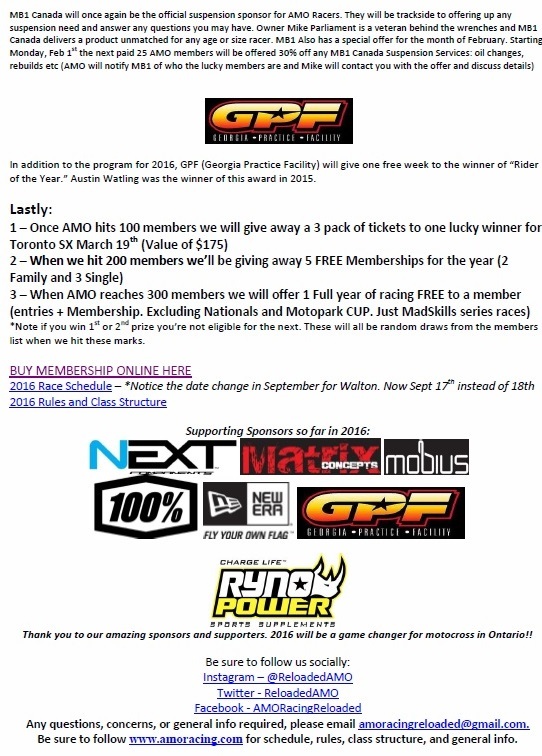 In addition to the program for 2016, GPF (Georgia Practice Facility) will give one free week to the winner of “Rider of the Year.” Austin Watling was the winner of this award in 2015. 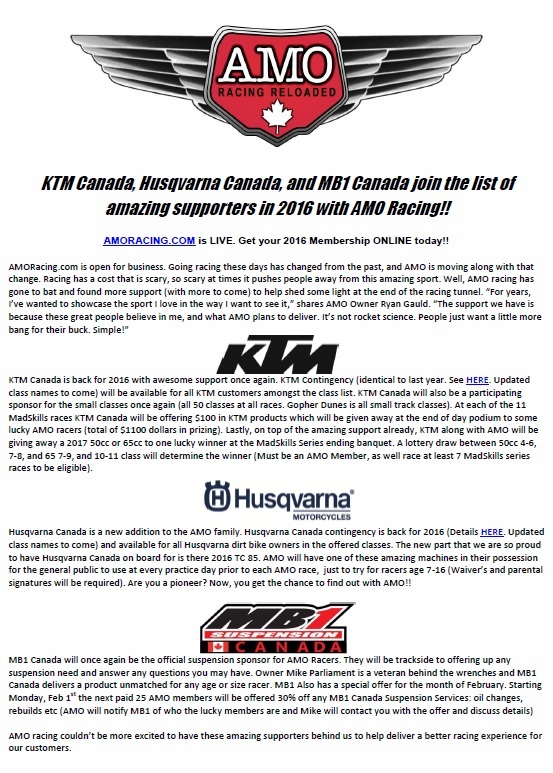 PDF – AMO Racing News Letter #2 – KTM Canada, Husqvarna Canada, and MB1 Canada join the list of amazing supporters in 2016 with AMO Racing!! PDF – AMO Year End Banquet a Huge Success. Bring on 2016!!! Family is not necessarily defined by bloodline. We spend our weekends at the track riding and racing with our extended family. One of our fellow riders has been struck with Cancer. 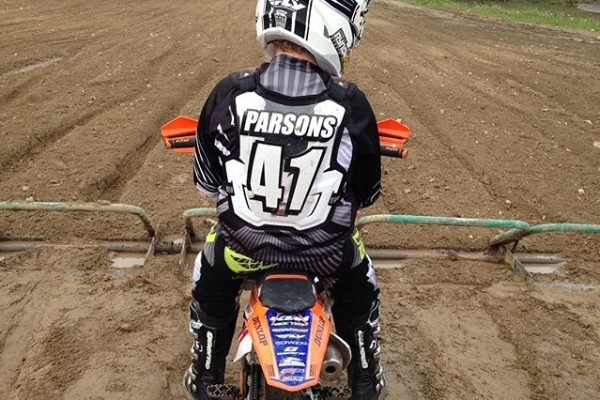 Please donate what you can to help Liam Parsons and his family through this battle. Donations will be used for out of pocket expenses that will be incurred during treatments. PDF – AMORACING.COM is LIVE. Get your 2016 Membership ONLINE today!! AMO will set up another option in the New Year so the member can fill out the forms and mail them if that’s preferable for the customer. For now it’s ONLINE only.